The consummation of the Netflix deal will add more consistency to New Mexico’s film industry, as the company will not only need to spend a billion dollars over the next 10 years but, according to Keyes, will need to meet “certain requirements each year to keep the facility at a certain level of production spend.” Keyes’ Albuquerque Film Office and Netflix will look to keep the stages full, and they’re off to a good start. They have “already received a ton of phone calls and inquiries from other studios that don’t necessarily want to do just one-off movies,” says Keyes. Thanks to the election of film-friendly Governor Michelle Lujan Grisham, New Mexico’s attractive incentive program will likely stay in place, and the caps will probably increase in 2019. A primary benefit will be the training of New Mexico locals to work in the industry. Several programs currently in place to give job opportunities to locals will be expanding this year, including the S-CAP (Student Conference Award Program), as well as apprenticeship programs and highly skilled trainee programs. One major program to be implemented is a training program for locals, which will function as rigorous preparation for students seeking entry into the film industry. According to Keyes, Albuquerque Film Office has “met with CNM (Central New Mexico Community College), and UNM (University of New Mexico), to find ways to funnel these students into the film industry.” The question they’re focused on is how these students can get jobs right out of school. The Albuquerque Film Office and Netflix are working with the New Mexico-based film union, IATSE Local 480, to see what crew positions are needed. “What we have too many of and what we don’t have enough of,” Keyes adds. Keyes anticipates that Netflix jobs will be available to recent graduates, who will likely fill the roles of production assistants to get experience fast. But the ABQ Film Office, in connection with CNM and UNM, are also looking to set up some advanced training, including special effects makeup classes and construction and electrician programs, which will have a special focus on the film industry. Used with permission. This article appears in MovieMaker’s Winter 2019 issue. 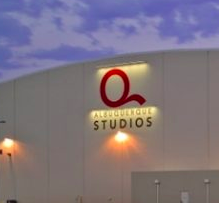 Featured image: Right on Q: Netflix and ABQ Studios’ long-term partnership foretells New Mexico’s future as a production powerhouse. Image courtesy of Albuquerque Film Office.